Horizontal anisotropy is the ratio of transmissivity or hydraulic conductivity along a column to its component value along each row. The Anisotropy settings in Visual MODFLOW Flex may be accessed in the Run section by selecting MODFLOW/Anisotropy from the top menu bar. The Anisotropy Factor window (as shown in the figure below) will provide two choices for determining how the anisotropy is calculated for the model. 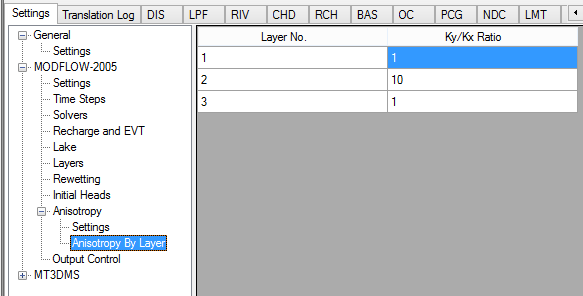 The Anisotropy by layer option uses the anisotropy ratio (Ky/Kx Ratio) specified for each layer of the model (as shown in the figure), and the Kx values specified in each grid cell, to calculate the Kx or Ky values for each grid cell. Selecting Anisotropy by layer will not replace the original modeled values for Ky, but will instead calculate values during the translation of Visual MODFLOW Flex file formats to MODFLOW input data file formats to be used for the run. By default each new simulation will be set to use the Anisotropy by layer option. The Anisotropy as specified option will use the Kx and Ky values defined for each property zone. This feature allows spatially variable anisotropy within a layer, as opposed to the Anisotropy by layer option which applies a single anisotropy ratio (Ky/Kx Factor) for the entire layer. A more in-depth discussion of spatially variable anisotropy can be found in Kladias (1997). 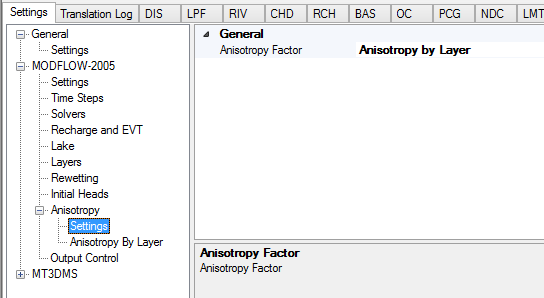 Note: MODFLOW-2000 does not support running the BCF package with Anisotropy as Specified.